Information, tips and tricks to help young adults better handle their money as they head out on their own. The following infographic is getting TONS of attention and repins on Pinterest in the past week. Why? Because the timing is right - the information is relevant - and people are paying attention! Have a look for yourself. 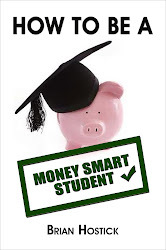 'How to Get Free Money For College' is aimed mostly at our American friends because it talks a lot about FAFSA - but there are also some great general tips and sources included. Enjoy and spread it around! If it's a little too small to read you can go to my Pinterest page HERE to have a better look. THE BOOK! Available now in paperback and in e-book format!